The FMSNA Corporate Office and main warehouse is located in Chesapeake, VA, only a few miles from the Norfolk Naval base. 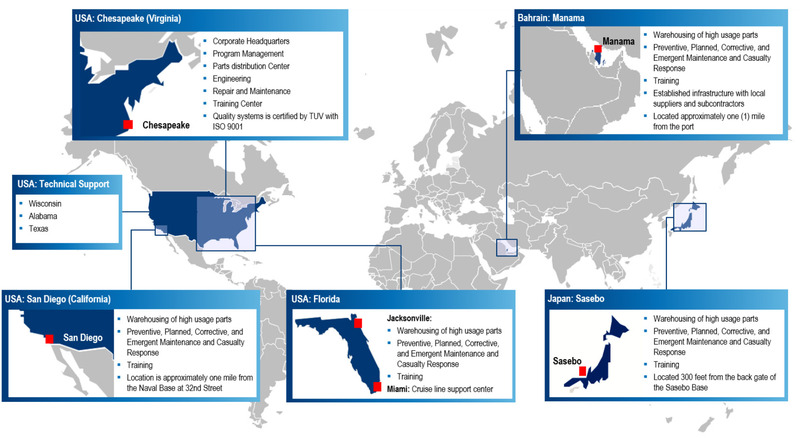 In addition, FMSNA has four Service Centers located within a close proximity of important Naval Bases in San Diego, CA, Mayport, FL, Manama Bahrain and Sasebo Japan. These strategically placed locations allow FMSNA to provide around-the-clock technical and spare parts support to their clients on a 24/7 basis-worldwide. FMSNA has offices in key fleet concentration areas allowing for rapid response to customer’s service needs ensuring maximum operational readiness of the fleet. All office locations are staffed with experienced technicians and state of the art equipment.